Some mornings, sleep just appeals more than a shower. On those days, this dry shampoo is a major must-have. It's especially great for all types of thin hair, as it leaves locks with incredible volume, texture and lift while absorbing excess oils and leaving out the white residue. So enjoy a few more zzz's before you get ready — this dry shampoo has you covered. Ingredients: DIMETHYL ETHER, SD ALCOHOL 40-B (ALCOHOL DENAT. ), VP/VA COPOLYMER, PANTHENOL, ACETYL TRIETHYL CITRATE, SERENOA SERRULATA FRUIT EXTRACT, PANTHENYL TRIACETATE, FARNESYL ACETATE, FARNESOL, PEG/PPG-17/18 DIMETHICONE, WATER /AQUA/ EAU, GLYCERIN, ZEOLITE, FRAGRANCE (PARFUM), LIMONENE. I was really hesitant about this buy, but I have tried so many others...I was determined to give this one a try. So glad I did!So much better than I expected...so much! Makes hair clean looking, shines...and it gives body! 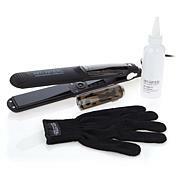 I have fine hair, so this is always a big plus for me.Thanks, HSN! I've been trying out different brands of dry shampoo, and I like Keranique the best so far. It's lightweight and less sticky. Not crazy about the smell; however, it fades away pretty quickly. Excellent product, saves time and provides body! I was skeptical at first about this invisible shampoo, simply because I had never used one before. But it really does work! After spraying it on my hair and a quick blowdry, it had just as much bounce and body as after a regular shower with shampoo and conditioner. Great for those extra crazy mornings:) Smells nice too! As a woman with thinning hair, I don't wash my hair every day as I know styling it with a blow dryer and other hot tools can cause more damage. My hair is fragile and breaks easily. 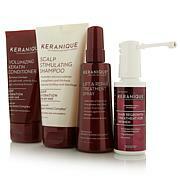 Therefore, I am so glad to have found this great product from Keranique! First, it doesn't leave a white or chalky residue on my hair which is medium brown but it does definitely absorb oil and refreshes my hair nicely. And it helps add some lift and texture to my hair, which can become flat really quickly since it's so thin. That means the name of this is pretty accurate: Volume Boost Invisible Dry shampoo - how about that!?!?! It describes it perfectly. I will be recommending this to ALL my friends and family and anyone with thin hair who wants some help between washings! Really good stuff! Thank you, Keranique! Was really looking forward to receiving this product. Quite highly scented! Don't like the spray nozzle at all. It provides too much of product at one time.